DataMatrix Encoder GUI provides a fast way to create DataMatrix barcodes on the fly. From the program you can easily create barcode strings or images and transfer them to a graphics designer or word processor. Using this GUI program is straightforward. Enter the data encode in the edit box. The barcode changes as you type. You can change the barcode size by changing the font size. The following lists the major items in the dialog. Both rich text format (RTF) and text format are placed in clipboard. In applications that are capable of processing RTF (Rich Text Format), you will see a barcode immediately after pressing the paste button. Otherwise, you will see the text string instead. If this is the case, highlight the whole string and format with “MRV DataMatrix5” font. This section displays the actual size of the bacode. 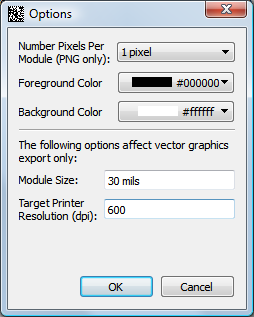 In the dialog above, the actual barcode has a size ID of 5 (20 by 20 modules). Click on this button to pop up the About dialog. License info is accessible through this link. This section displays the absolute path and the file version of the encoder DLL. This is useful to troubleshooting potential DLL confilicts. Specify the size desired. The size is divided into two parts: the left siginiicant byte which indicates the datamatrix size, and a modifier byte that can be used to adjust encoder behavior. The modifier byte is specified through a hexdecimal value. See Appendix C, Size ID Parameter (updated in version 5.1) for more information. 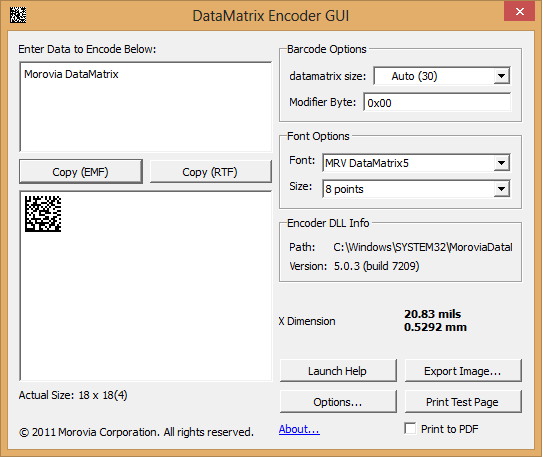 Datamatrix Encoder GUI supports exporting into several standard image formats. The images generated do not contain references to the fonts so that you can move around them without requiring the software to be installed. Specify the color for image background and foreground. Color values are specified using six hexidecimal digits, with the components in the order of red, green and blue. For exmaple 000000 is the value for black color, and ff0000 is the value for red. Note that changing color may reduce the readablity of the barcode.